Kensington Homes Inc. has been building in the Cleveland area since 1993, and is proud to present The Reserve at Pine Lakes Village, one of Strongsville's largest cluster home communities. Michelle Goldberg Sorenson, President of Kensington Homes, represents the second generation of her family to dedicate themselves to creating fine quality homes of exceptional value and style. Standing behind her employment of the highest standards of craftsmanship, Michelle personally supervises every step of the home building process from design to finish, preferring to maintain total control over every project. Her careful attention to detail, as well as use of quality materials, enables Michelle to produce a superior home of distinction and excellence. While leading a company that values integrity, she creates homes that become enduring sources of pride and enjoyment. The Reserve at Pine Lakes is planned community of 148 single family detached cluster homes located in Strongsville, Ohio. With easy access to the Ohio Turnpike, I-71 and I-480, residents enjoy convenient travel to downtown, the Cleveland Hopkins International Airport, shopping, entertainment, and hospitals. Follow the winding streets and cul-de-sacs of the neighborhood to find stunning limited maintenance cluster homes that have flexible floor plans that can be easily customized, at affordable prices. Take I-71 to Rt. 82 East. Turn left on Webster Road. Turn right on Albion Road. Turn right on Forestview Drive to Baywood Lane, and turn right. Continue on Glenbrook Drive to Laurelbrook Oval and turn right, following signs to 13953. The Reserve at Pine Lakes Village is a cluster home community of 148 cluster homes to be built. It is located within the Pine Lakes Village Subdivision located near the northeast quadrant of Strongsville, Ohio, which consists of approximately 500 homes. It is conveniently located close to I-71, 15 minutes to Cleveland Hopkins Airport and 25 minutes to downtown. 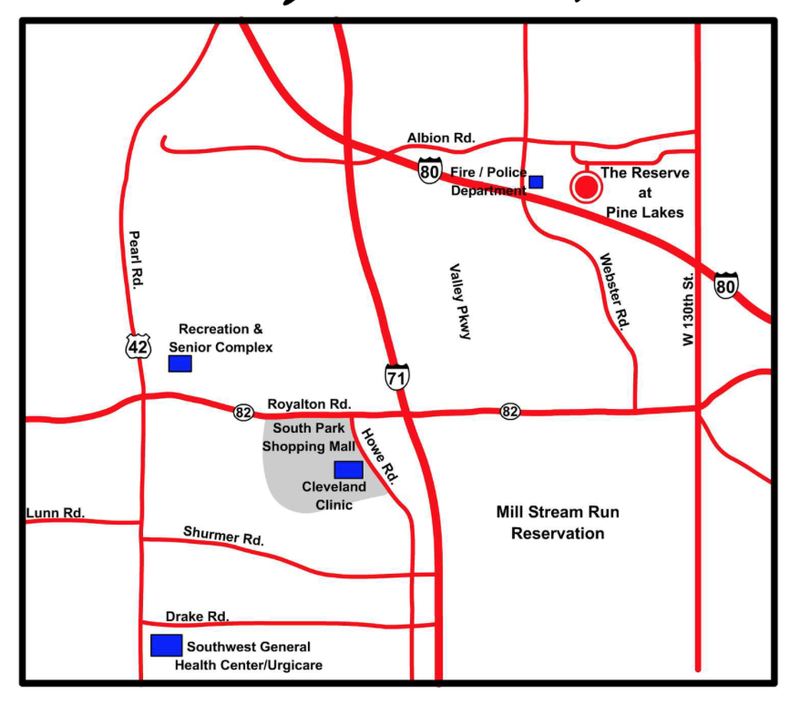 It is also close to the Southpark Mall and nearby shopping, restaurants, and metroparks. Strongsville offers nine city parks including baseball fields, football fields, tennis and basketball courts, playgrounds and pavilions in addition to a state-of-the-art Recreation and Senior Center. Strongsville’s recreation center, 18100 Royalton Rd., offers a vast array of classes, programs and activities for every age, in addition to a pool/aquatic center, gym, track and a huge assortment of workout and weight equipment. The front desk can be reached at (440) 580-3260. Please visit the Senior Center pages for information on amenities and programs for seniors. Low maintenance living in the Reserve at Pine Lakes Village includes yard maintenance & snow removal for a low $100 monthly fee. Residents also enjoy all of the amenities of Pine Lakes including hiking trails, tennis courts, community center & playground. For More information on the Homeowners Associate click here! The Pine Lakes Clubhouse is the perfect facility to host an event. Your homeowners association is proud to offer this wonderful facility for the many needs of its residents. The clubhouse has hosted many events from birthday parties, to wedding/baby showers, and Holiday parties. Kensington Homes Inc was one of the first Ohio builders to earn the National Association of Home Builder’s Certified Green Professional designation, and is currently working on achieving the Masters level. The courses required for achieving this designation follow the ICC 700 National Green Building Standard. Green Building refers to both the use of green building methods and sustainable building principles into the life cycle of the home, including siting, design, construction, operation and maintenance. By adopting greener practices, maximum environmental and economic performances can be achieved. Green building benefits the homeowner by providing better durability, energy savings water savings, and a more comfortable home.